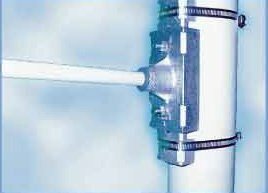 Time-tested WindMaster™ Light Pole Bracket offers the feature that allows your banners to be tightened and adjusted without removing the plates from the light pole. Arms adjust up and down 2.5", making normal maintenance an easier task and saving the cost of replacement hose clamps or stainless steel banding or buckles. eDecorSource offers a full line of light pole banners in a variety of themes and sizes for your year round banner decorating needs.